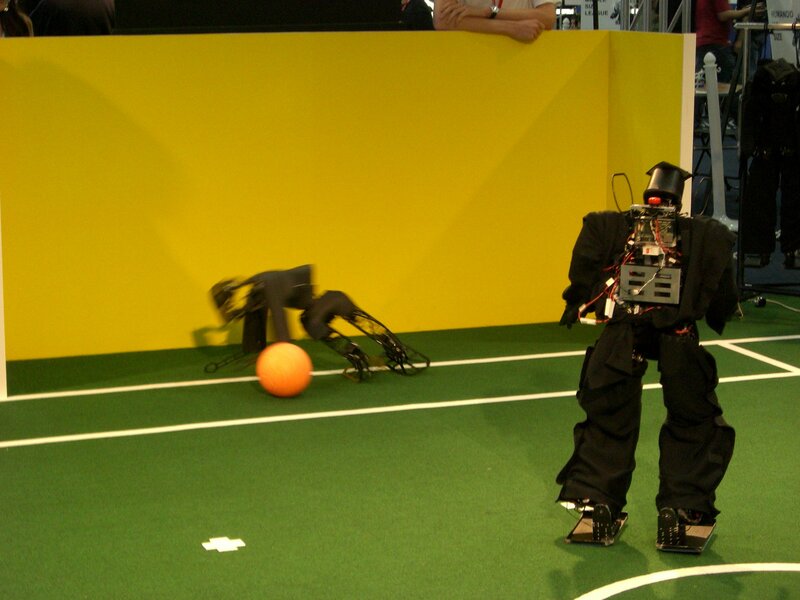 Team NimbRo won all finals of the Humanoid League at RoboCup 2007! We are the winner of the Kidsize 2 vs. 2 games as well as the winner of the Teensize penalty kick competition. Additionally, our Kidsize and Teensize robots were elected to be the second and third best humanoid robot teams right after the Kidsize robot of Team Osaka. We are the new world champion of the 2 vs. 2 games! 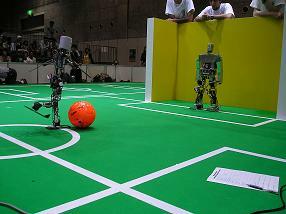 Our Kidsize robots Jürgen and Lothar won against the champion of the last two years Team Osaka. Our robots performed very well and scored 8:6 goals! We are the winner of the Teensize penalty kick competition! We just won the final against Team Pal. The score was 4:4 after five alternating trials. 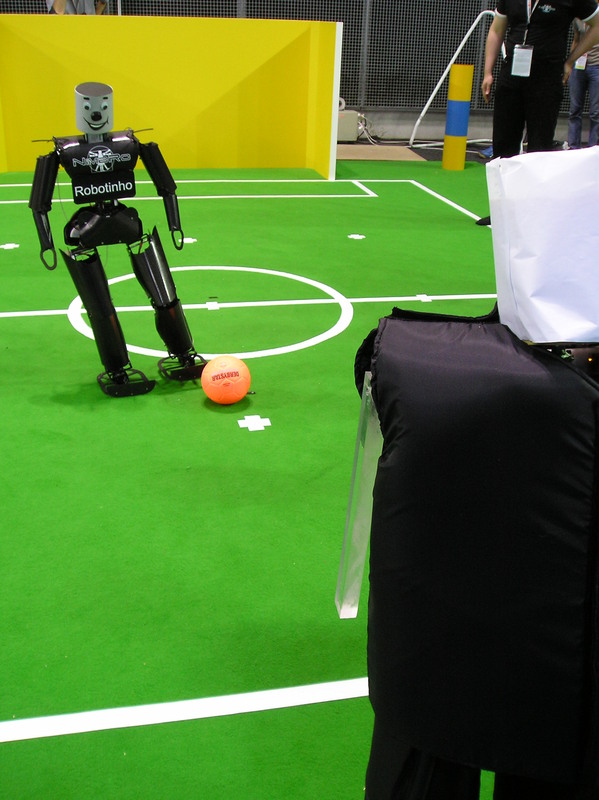 Then, Bodo successfully defended its goal and Robotina scored the final goal (see photo). Thus, the final ended 5:4 for NimbRo. We just reached the final of the Kidsize 2 vs. 2 games! 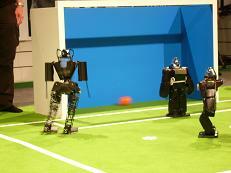 Our robots Lothar and Paul scored 11:0 goals against Team FUmanoid from Berlin. 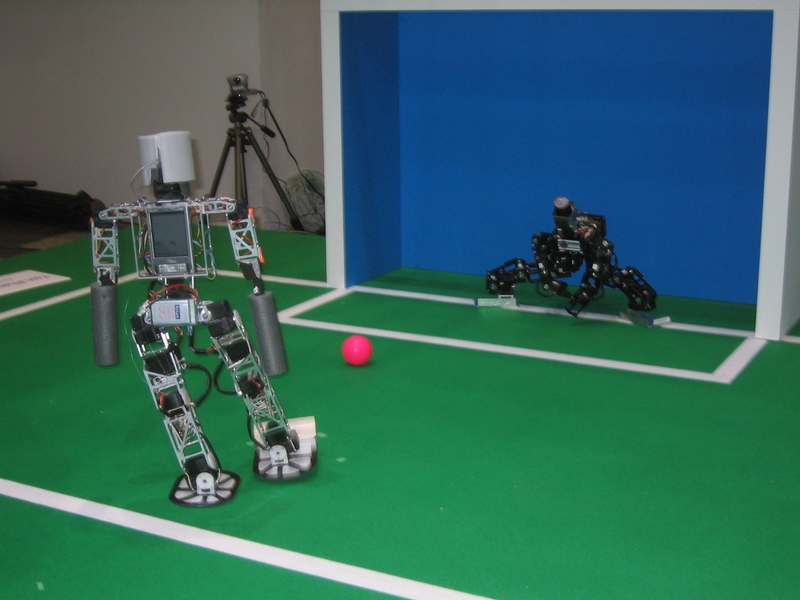 The photo shows our robot Lothar scoring a goal against robot Lolos from FUmanoid. In the final tomorrow at 1 p.m., we are playing against last year's champion Team Osaka. We are looking forward to it! The quarter final in the 2 vs. 2 Kidsize games against the Darmstadt Dribblers was very exciting! After the first half, Darmstadt Dribblers lead 4:2. However, in the second half, our robots caught up and the game ended after regular time in a 5:5 draw. 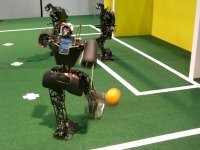 After extra time, the game finally ended 8:6 for NimbRo! 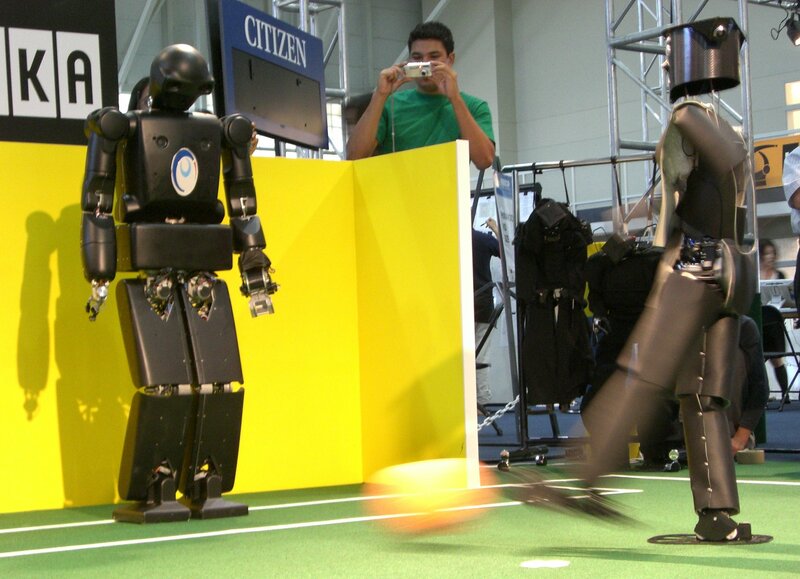 The photo shows our robot Paul scoring the second goal. This morning we played the half final of the Teensize penalty kick competition against Team Osaka. 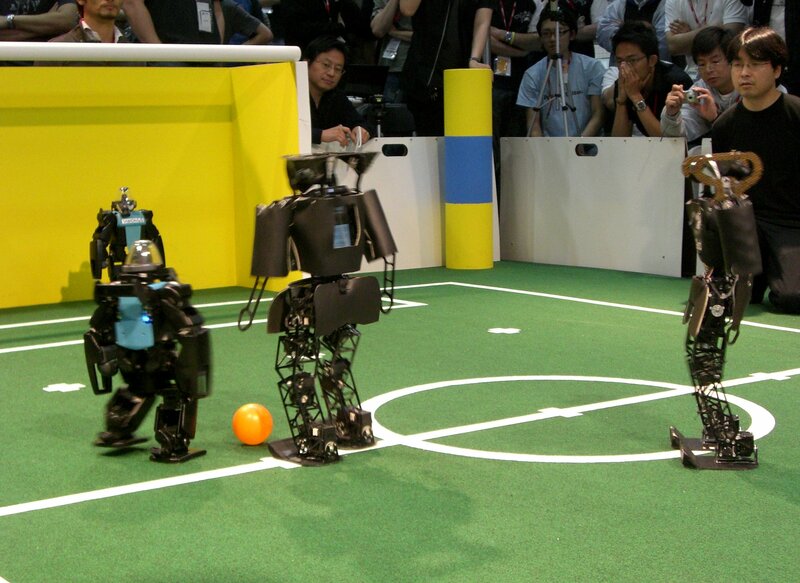 Our robots Robotina and Bodo performed very well and beat Team Osaka again. The final score was 4:3 for NimbRo. 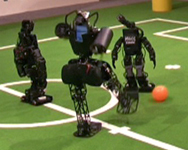 The photo shows Robotina scoring the third goal. On Sunday 9 a.m., we are playing the final against Pal Technology. Today was the Kidsize Technical Challenge. 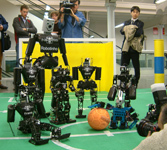 The best performing robot was the one from Team Osaka. We ranked third behind Team CIT Brains & Hajime. The photo shows our robot Jürgen successfully managing the obstacle avoidance challenge. 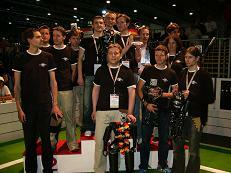 In the Teensize Technical Challenge, we achieved the second place. 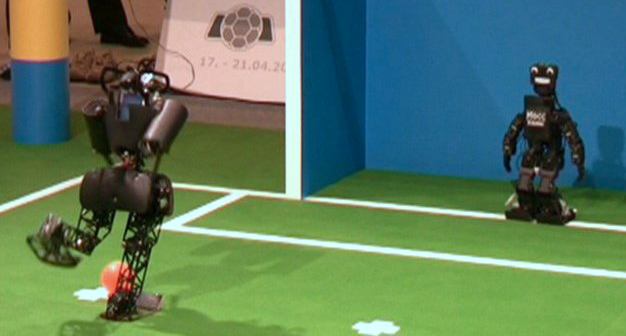 Our robot Bodo was the second fastest robot that completed the obstacle avoidance challenge. Also in the footrace we were the second fastest team. 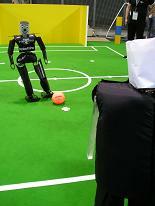 In the dribbling challenge (see image on the right), Bodo came as far as the winner robot from Team Osaka, however, he was not as fast. In the round robin of the Teensize penalty kick competition, we had three games today. In the first penalty kick game, we won 4:3 against Robo-Erectus. 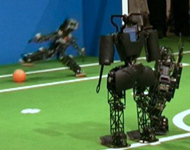 The image on the right shows Robotina after having scored the second goal. In the afternoon, we achieved a 5:0 against HWM, and a 4:2 against Team Osaka, the last year's champion. Thus, we have won all games so far and are the winner of the group with 27:10 goals. We play again against Team Osaka in the half final on Saturday. Furthermore, we won our last game in the 2 vs. 2 Kidsize competition against TH-MOS with 6:1 goals. 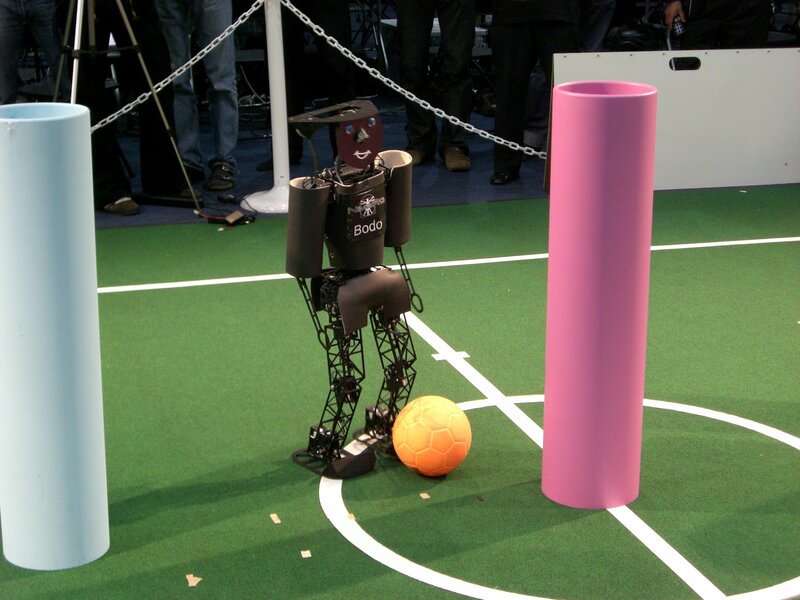 The picture on the right depicts our robot Rudi scoring the third goal. Thus, we achieved the first place of Group D with 30:3 goals! We are looking forward to the quarter final against Darmstadt Dribblers which is scheduled for Saturday. 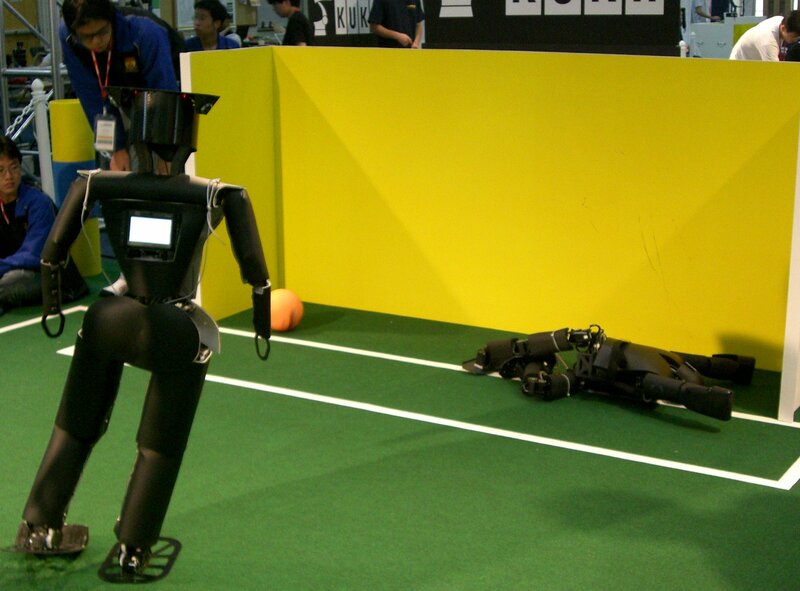 Today started the penalty kick competition of the Teensize class. In the round robin, our team scored 5:2 against Pal Technology. 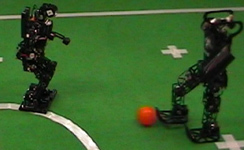 The photo depicts Robotina scoring against Pal. In our second match, we won 4:1 against Hajime. The photo shows our robot Bodo successfully defending its goal against Hajime. We also won the third Teensize class match against Tsinghua Hephaestus 5:1. Additionally, we had the third game in the round robin of the 2 vs 2 games. 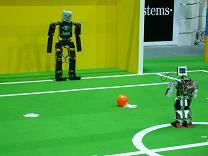 Our Kidsize robots won with 10:0 goals against Team UofM. 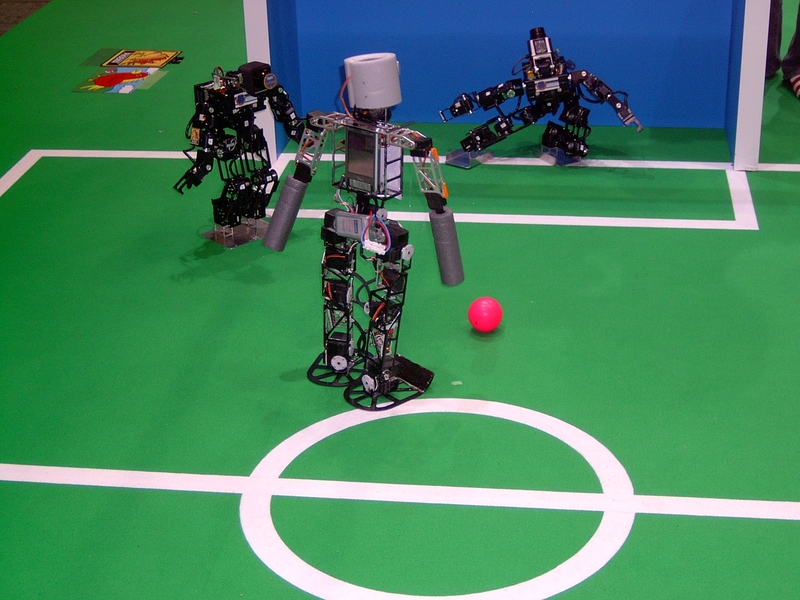 Team NimbRo participates in the Humanoid League of the RoboCup 2007 in Atlanta. 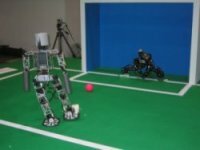 On the first day of competition, our Kidsize robots scored 5:2 against Team KMUTT and 9:0 against UChile RoadRunners in the 2 vs. 2 games round robin. On Wednesday, April 18th, the round robin for the 2 vs. 2 soccer games was played. 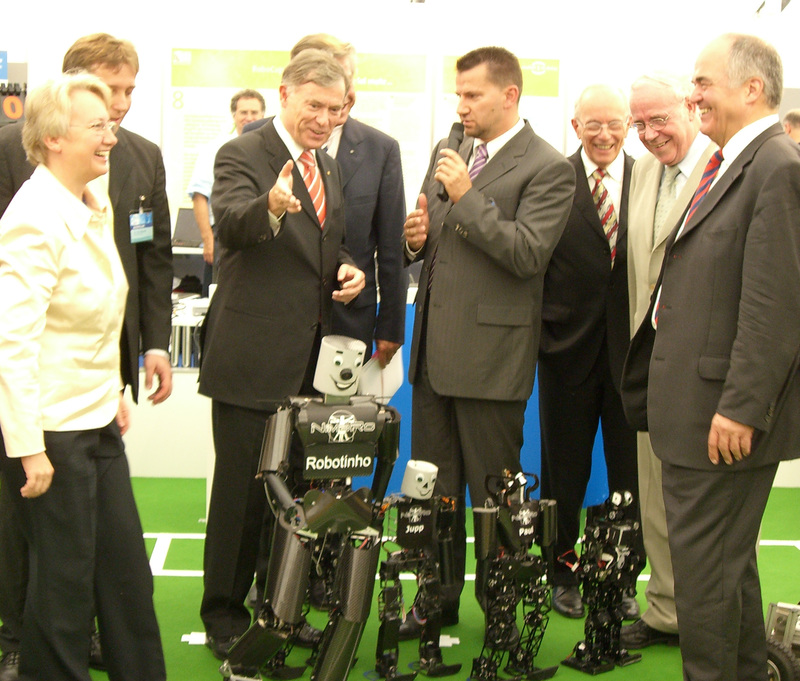 In our group we met B-Human and Humanoid Team Humboldt. Both games ended early with a score of 10:0 for NimbRo. This made our robots the winner of Group A. 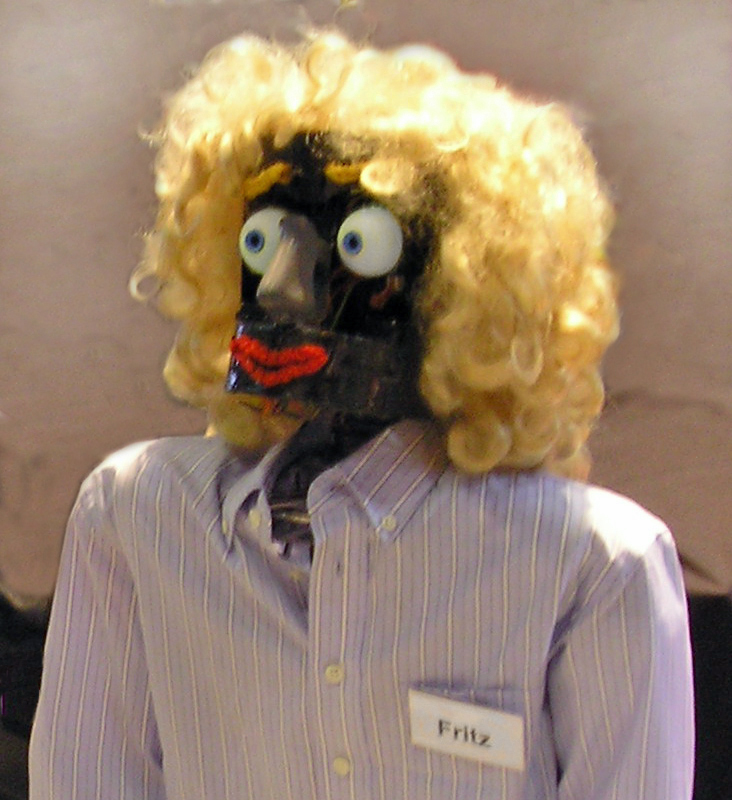 On Thursday, April 19th, our KidSize robots Paul, Gerd, and Franz won the Technical Challenges. They walked quickly through six black poles without touching any of them, passed the ball four times between two players, and dribbled the ball around three poles. 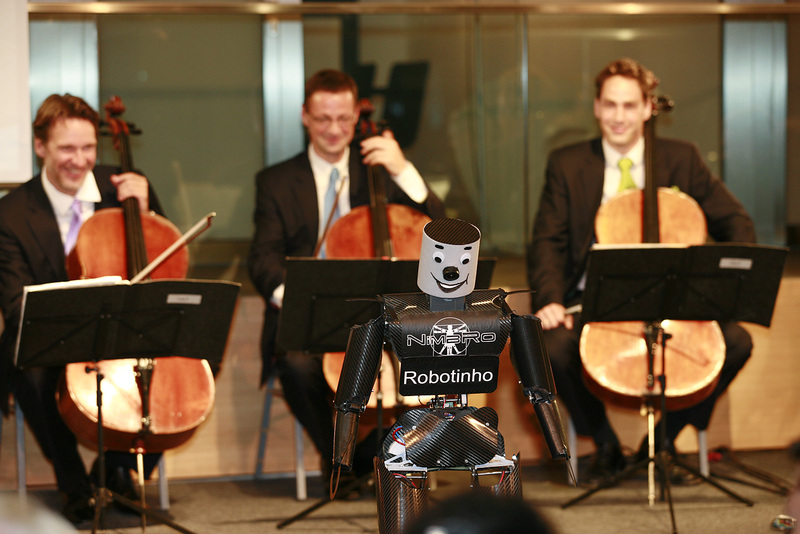 On Friday, April 20th, Robotinho participated in the Opening of the TectoYou initiative. He met the Federal Minister of Research, Dr. Annette Schavan. 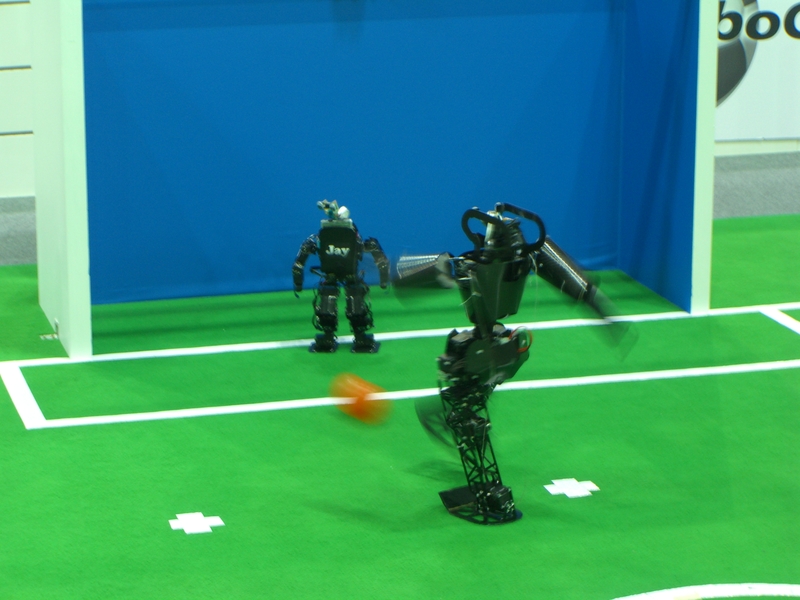 In the afternoon, our KidSize robots Paul, Franz, and Gerd played the semi-final of the 2 vs. 2 soccer tournament. 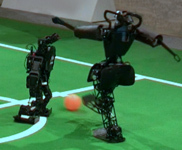 They met the team B-Human and won the game 6:0. On Saturday, April 21st, our KidSize robots Paul, Franz, and Gerd met Darmstadt Dribblers in the final game of the 2 vs. 2 soccer tournament. 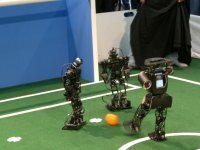 Our robots won 15:0. 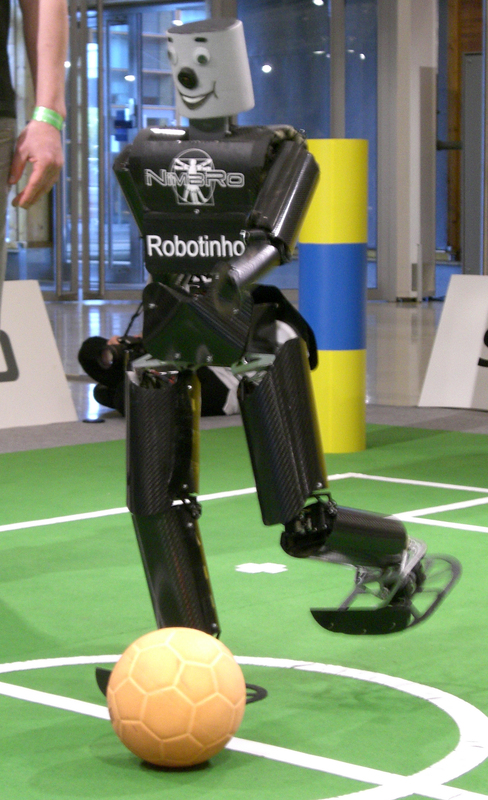 As on the other days, Robotinho demonstrated penalty kicks. Our soccer robots played for two days at the Humanoids 2006 conference in Genova, Italy. 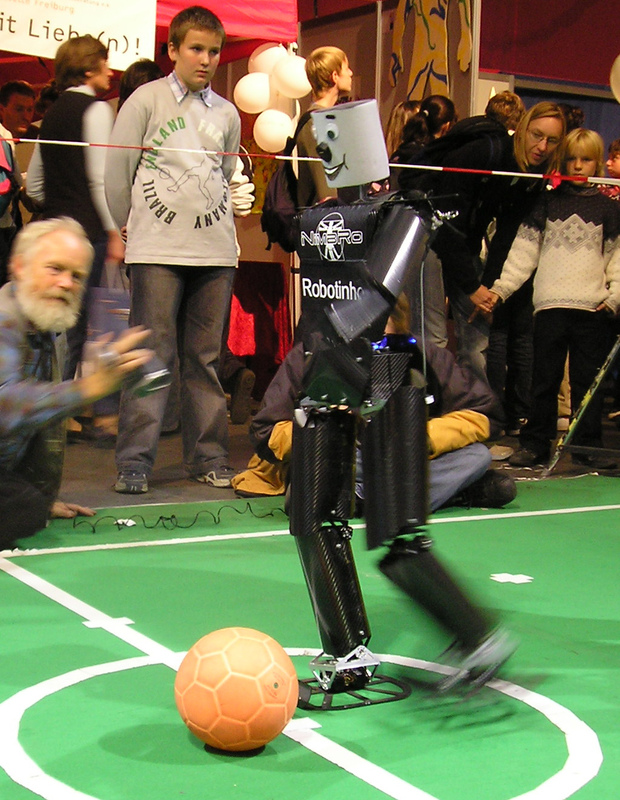 The Darmstadt Dribblers & Hajime team and the team Artisti also participated in the demonstrations. 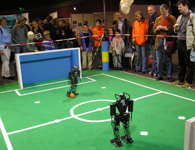 Our soccer robots played for three days at the Science Days in the Europa-Park Rust while our communication robot Fritz explained some smaller robots to the visitors. 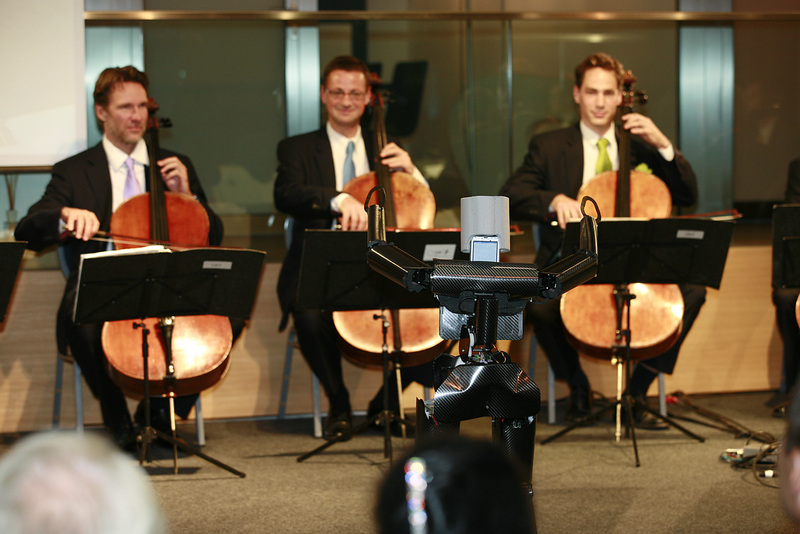 Our TeenSize robot Robotinho conducted the 12 Cellists of the Berlin Philharmonics in the Q110, Berlin. 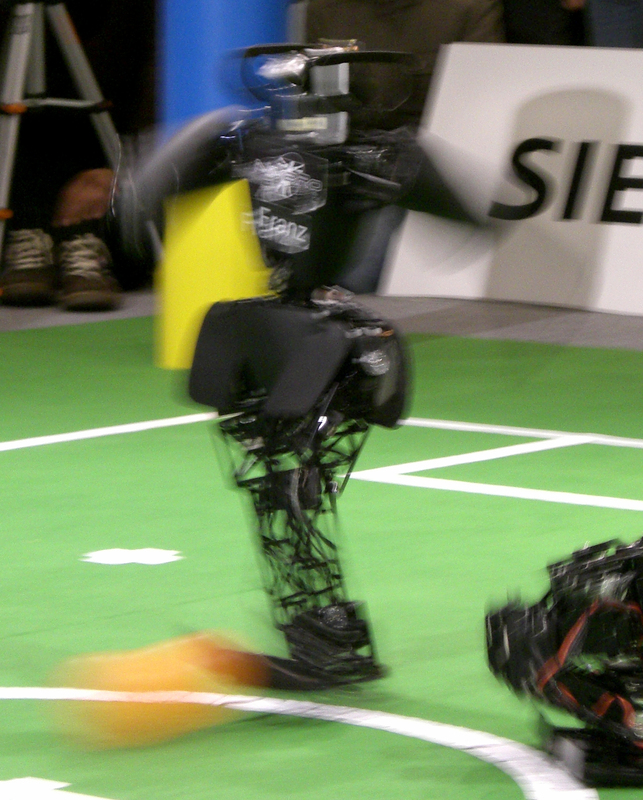 We presented our soccer robots at the Wissenschaftssommer 2006, which took place in Munich. 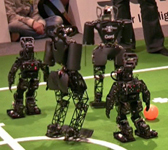 Our KidSize robots played many demonstration games with the Darmstadt Dribblers. 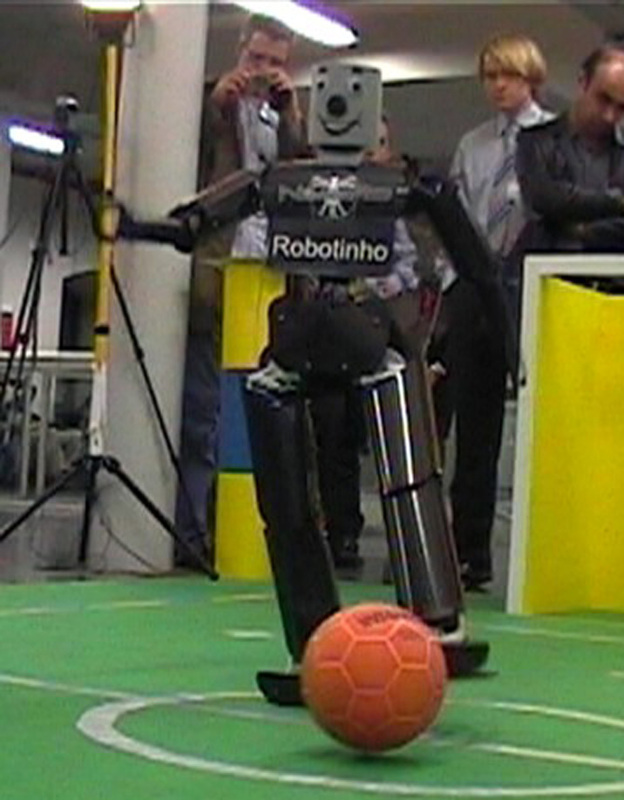 Robotinho performed many penalty kicks. and other officials visited our field. 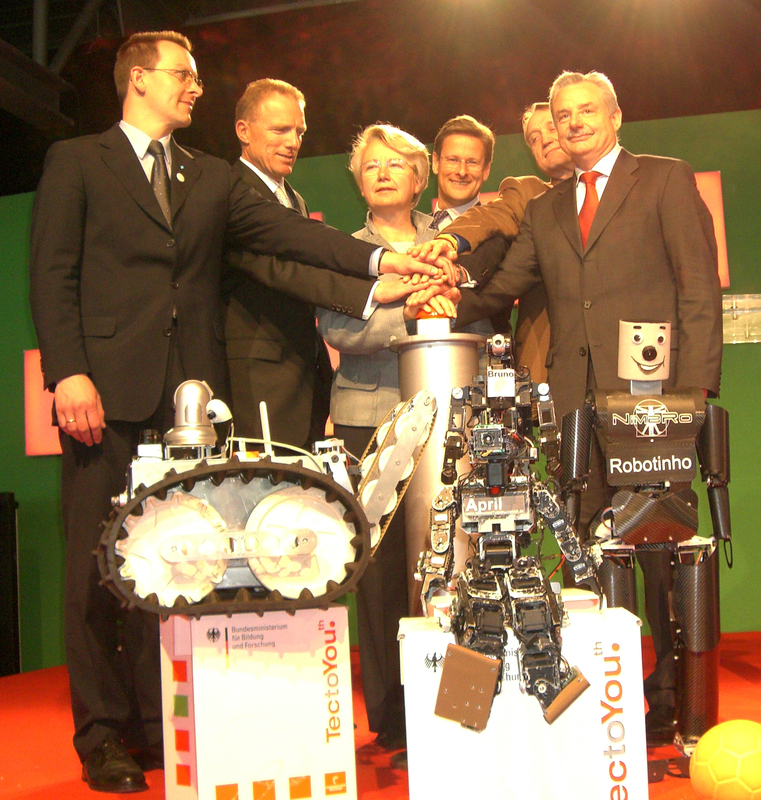 Team NimbRo was very successful at RoboCup 2006! In the Best Humanoid ranking our KidSize robots came in second, next only to the titleholder, Team Osaka. We made third places in the Technical Challenge and in the Footrace of the TeenSize class. 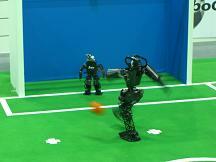 See all results of the Humanoid League at RoboCup 2006. It was an exciting 2 vs. 2 final against Team Osaka! After the first half of the game we lead 4:1. But Team Osaka managed to catch up in the second half and the game ended after regular time in a 4:4 draw. After extra time the game finally ended 5:9 for Team Osaka, which now is the old and new world champion in the 2 vs. 2 competition. In the penalty kick competitions we are world champion in the kidsize class and made the second place in the teensize class. 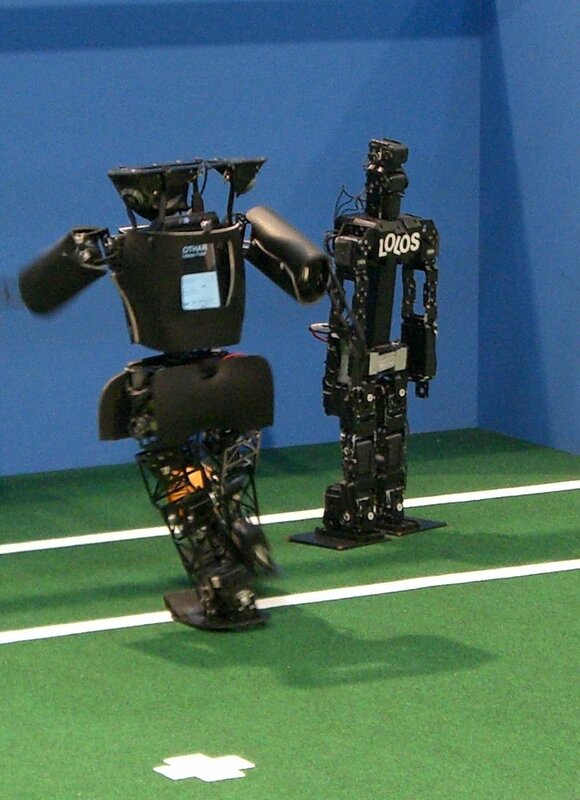 In the footrace we ranked third behind PAL Technology (first) and Team Osaka (second). It was a successful day for us! 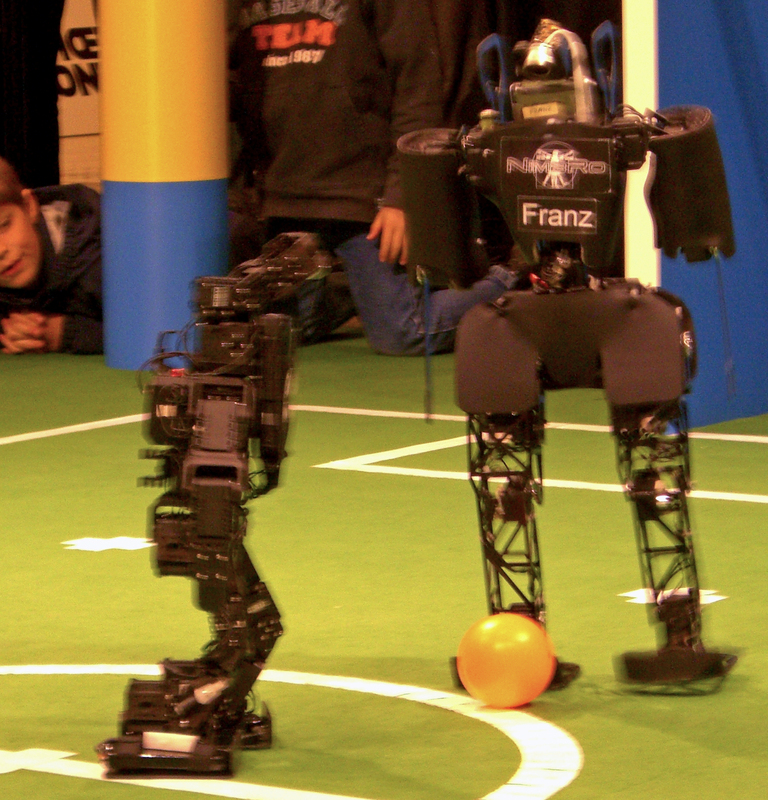 We reached the 2 vs. 2 final, as well as the penalty kick finals for kidsize and teensize. In all of these finals the oppenent will be Team Osaka. In the footrace we will compete for the third place tomorrow. The opponent will be Iran Fanavaran. On the third day the technical challenge for kidsize and teensize took place. 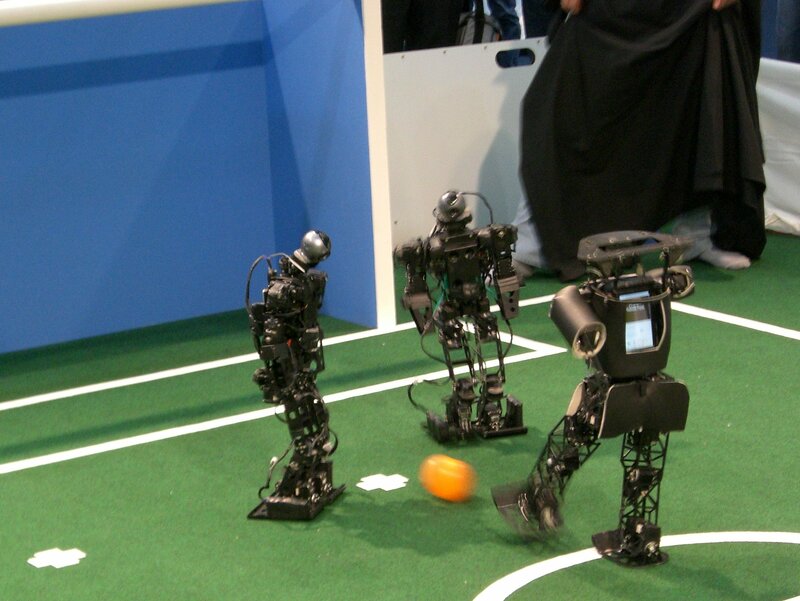 It consisted of three parts: Dribbling around three poles, passing the ball five times between two robots and walking across rough terrain. 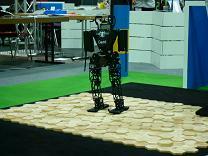 Our robot Gerd (photo) successfully walked across the rough terrain in 1 minute, 14 seconds. 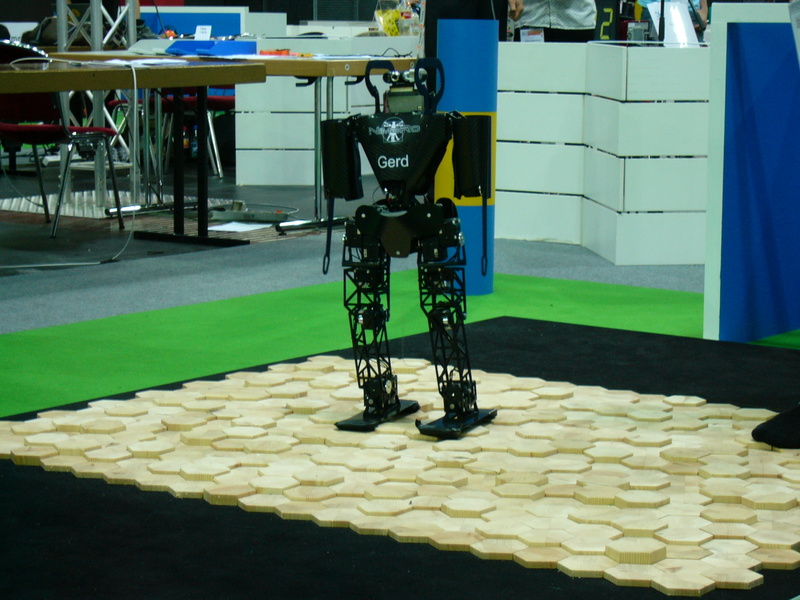 Only one other robot was able to walk across the terrain without falling. In the final result we ranked third behind Team Osaka (first) and Darmstadt Dribblers / Hajime Team (second). On the second day we took part in the teensize penalty kick round robin and ranked first before PAL Technology (second), Team Osaka (third) and Iran Fanavaran (last). The semifinal is scheduled for saturday. In the kidsize 2 vs. 2 round robin we are the second best of our group and qualified for the quarter final, which also is scheduled for saturday. 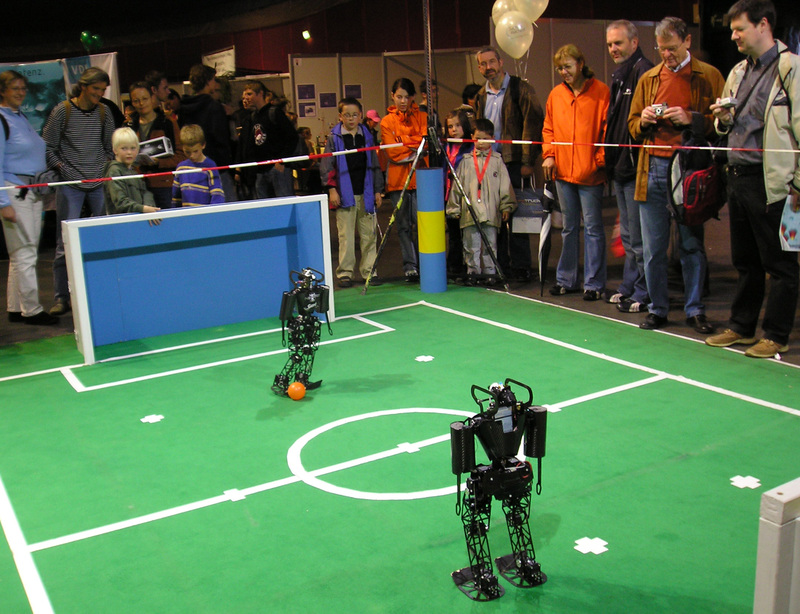 Team NimbRo participates in the humanoid league of the RoboCup 2006 in Bremen. 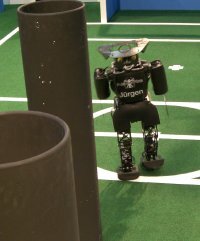 In the penalty kick round robin our kidsize robots scored 5:5 against RoboErectus, 5:0 against ToinPhoenix, and 4:0 against BreDoBrothers. Hence we are the group winner having scored the most goals of all participating teams. 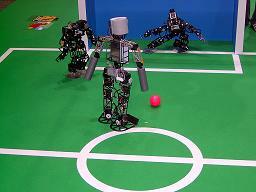 In the footrace our teensize robots ranked second behind Team Osaka and before PAL Technology. 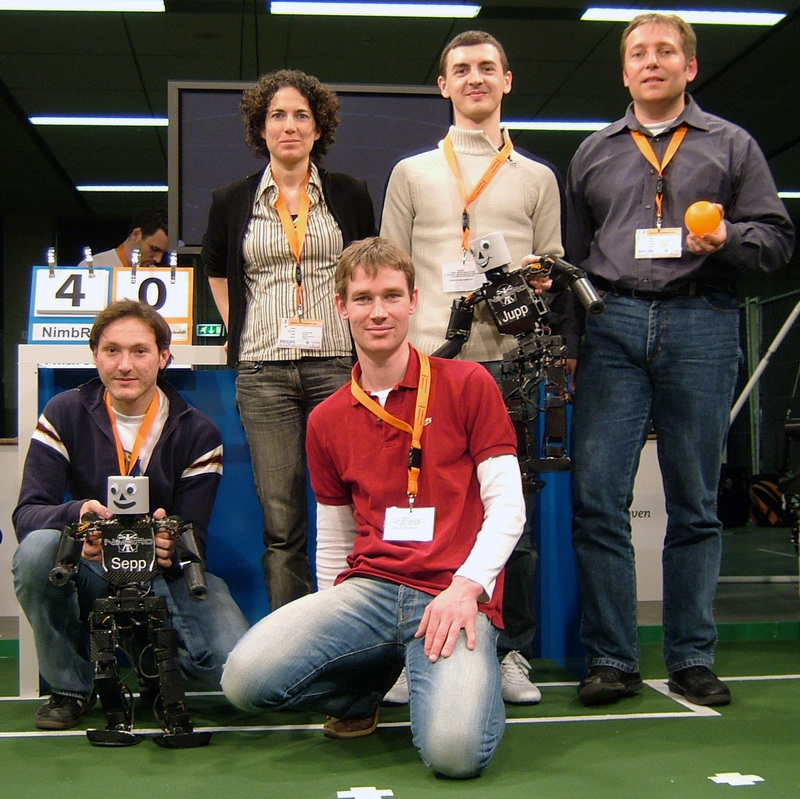 Team NimbRo won the Humanoid League of the RoboCup Dutch Open 2006. 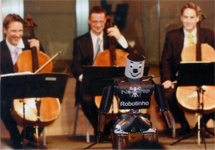 This event was part of RoboLudens. 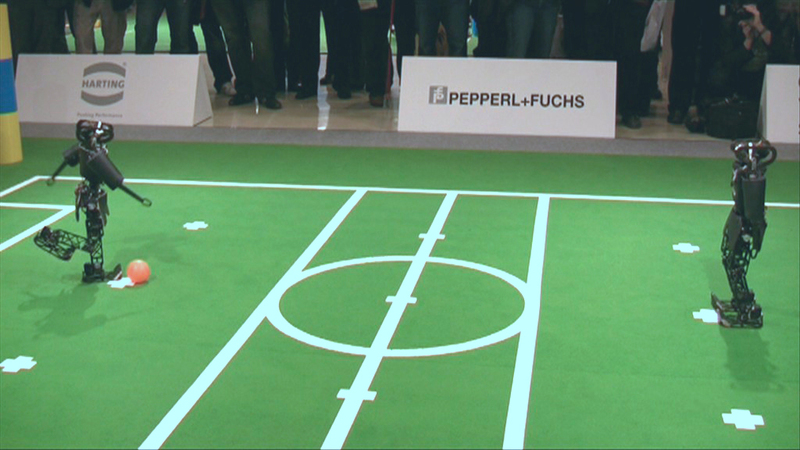 Our robots Jupp and Sepp reliably scored penalty kicks. They won the Penalty Kick final against Humanoid Team Humboldt 4:0. They also played a 2 vs. 2 demonstration game with goalies from BreDoBrothers and Humboldt. 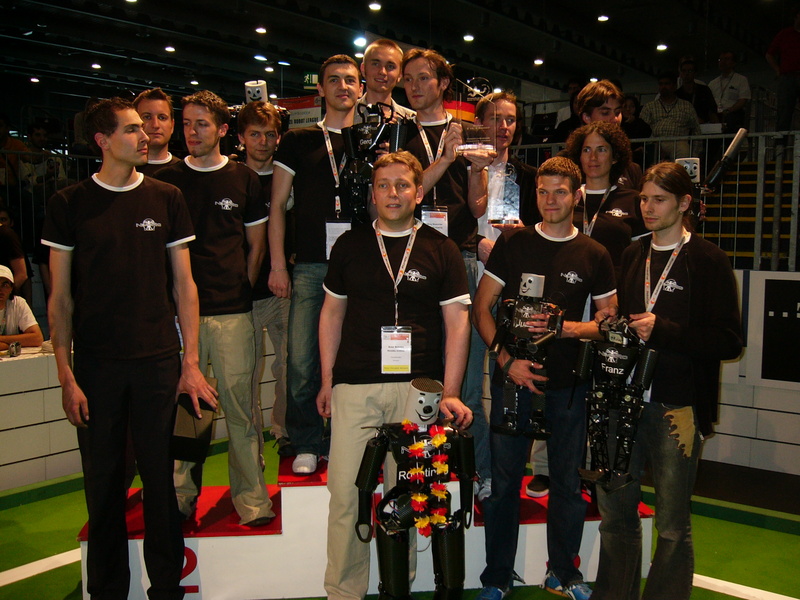 Team NimbRo was very successful at RoboCup 2005! 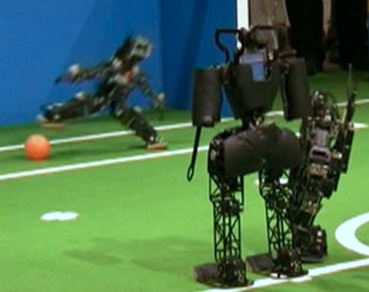 In the Humanoid Kid Size League, we were the second best team behind Team Osaka. 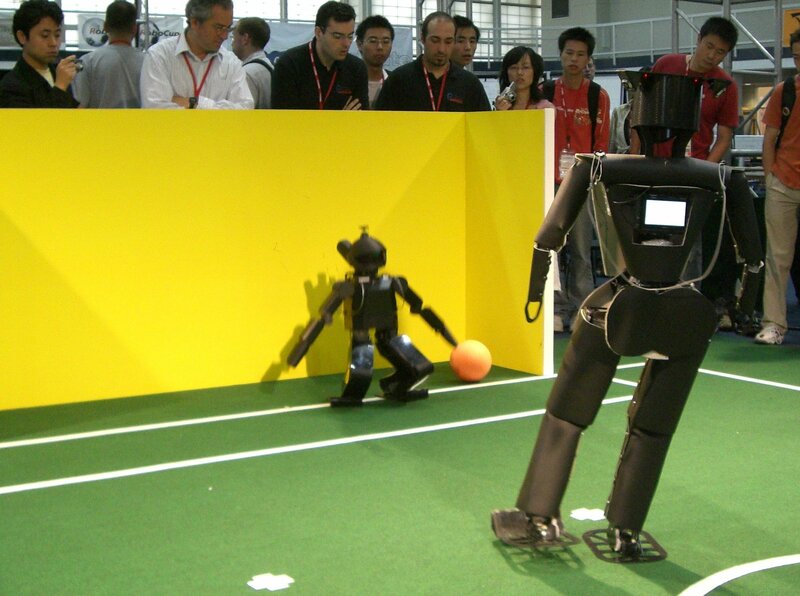 In the penalty kick competition of the Humanoid Medium Size League, we made even the first place. In the Kid Size League, our robots Jupp and Sepp made second places in the 2 vs. 2 games, scientific paper evaluation, and in the technical challenge. 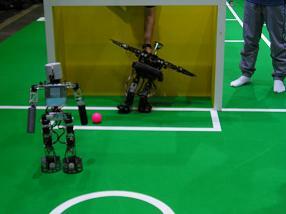 The third place of the technical challenge was also made by Team NimbRo with our medium size robot Max. 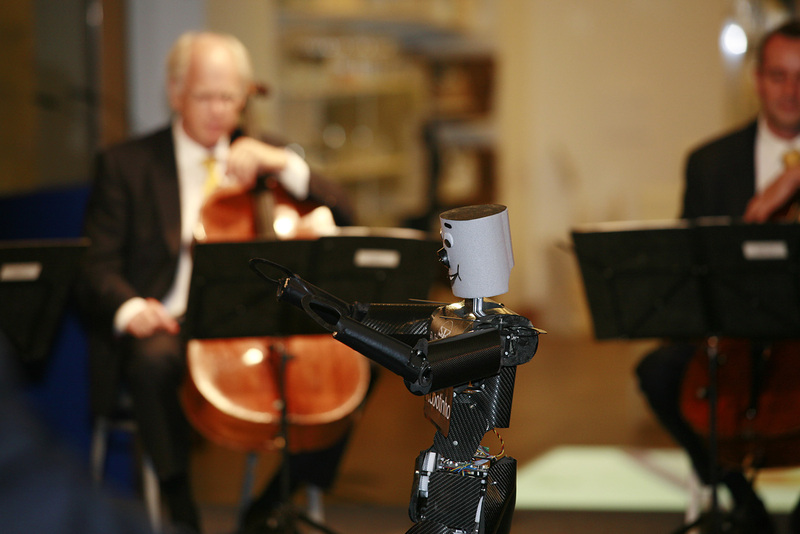 See a video about the performance of our robots. 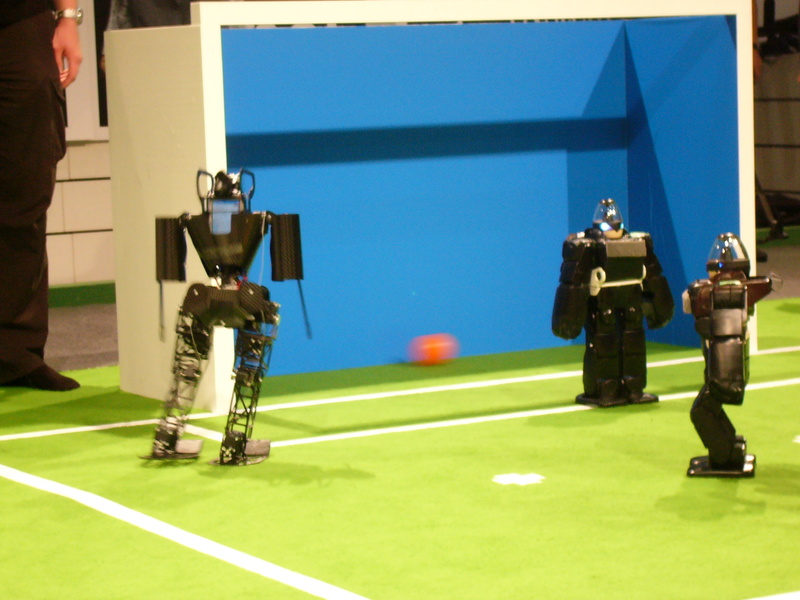 Team NimbRo won the final of the penalty kick competition in the Humanoid Medium Size League! We beat Team Aria 3 : 0. In the Kid Size League, we lost the 2 vs. 2 final against Team Osaka 1 : 2. It was an exciting game and our players performed very well. Team Osaka was the best team of the whole competition. The picture on the right shows Max about to score the third goal against Aria. Team NimbRo reached the final in the Humanoid Medium Size League! 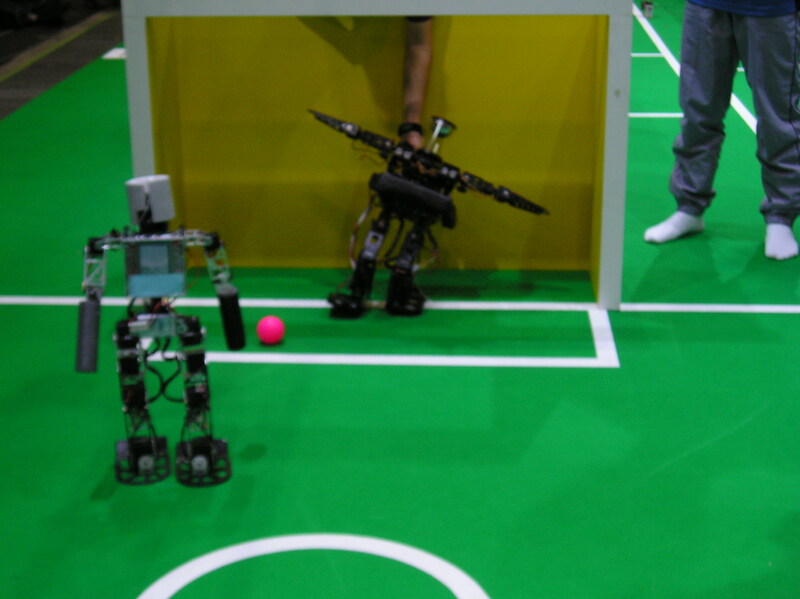 In the 2 vs. 2 games of the Kid Size League, we won our quater final match 2 : 0 against Team RoboErectus. 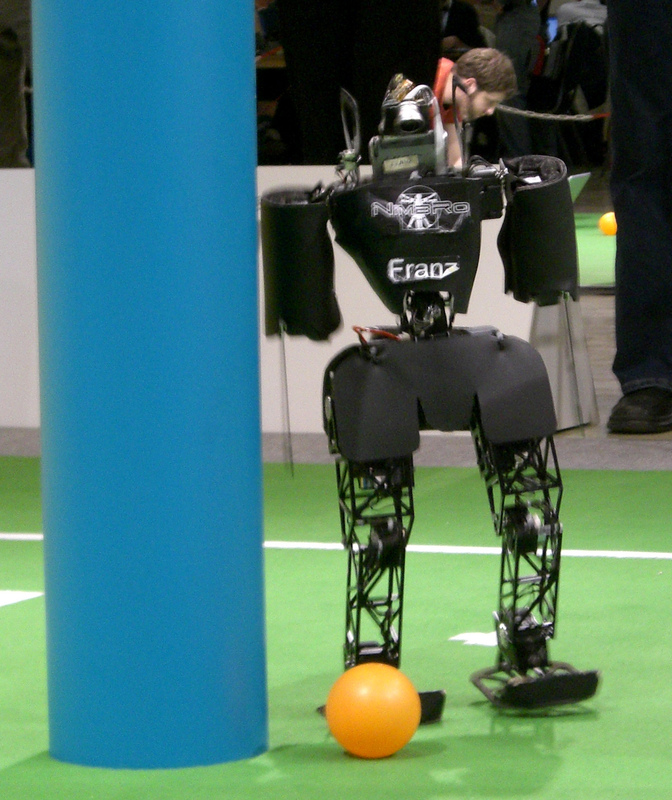 Unfortunately, we lost our quater final in the penalty kick competition, Team RO-PE had excellent players. The picture shows Jupp scoring a goal against RO-PE. 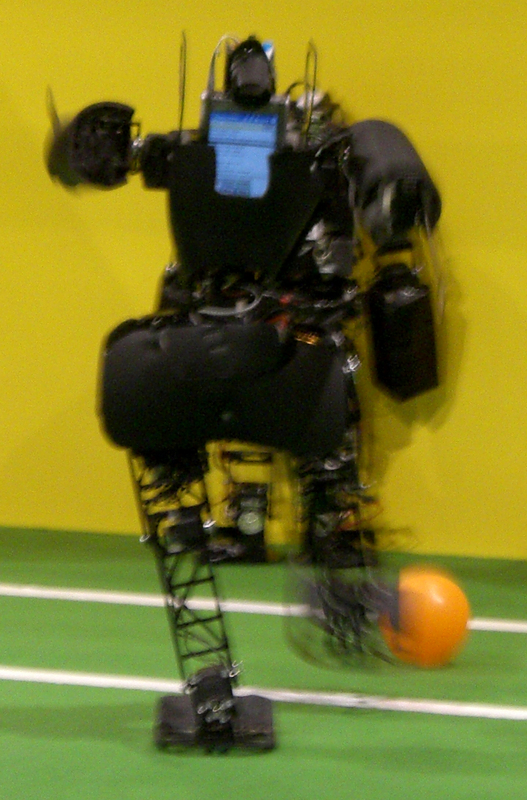 Team NimbRo reached the semifinal in the Humanoid Medium Size League! 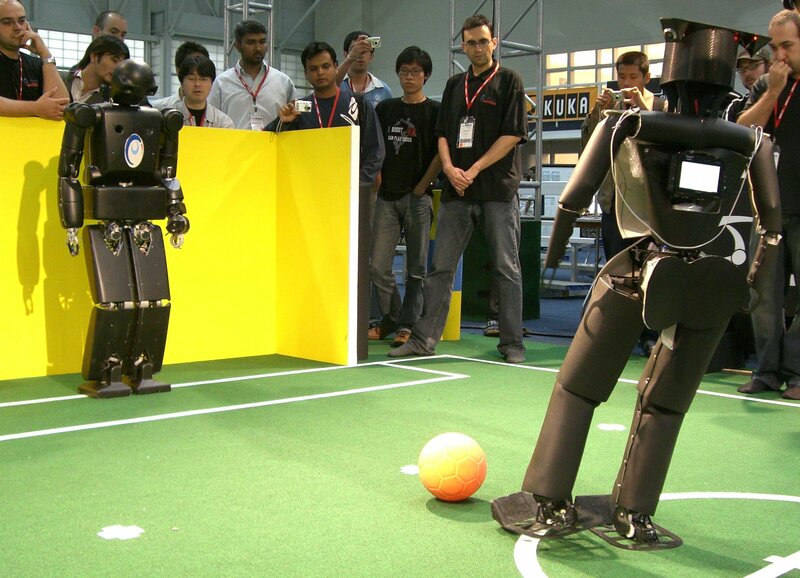 In the 2 vs. 2 games in the Humanoid Kid Size League, robots Jupp and Sepp also performed well and are now the leading team in Group D.
The picture on the right shows Jupp in an offense against Team ToinPhoenix. In the technical challenge of the Humanoid League, Team NimbRo achieved the second and third place! 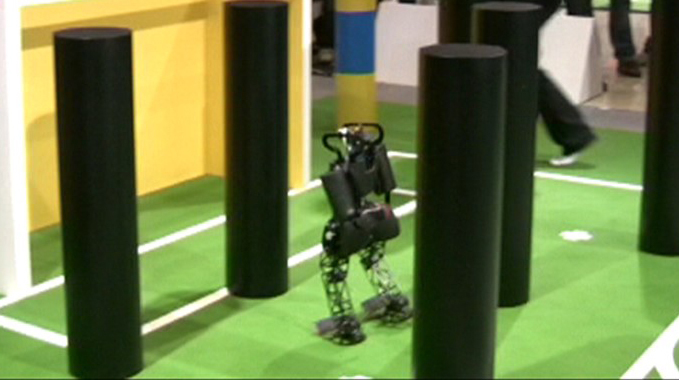 Robot Max walked around poles in the third best time and Jupp was able to kick a ball against a pole. 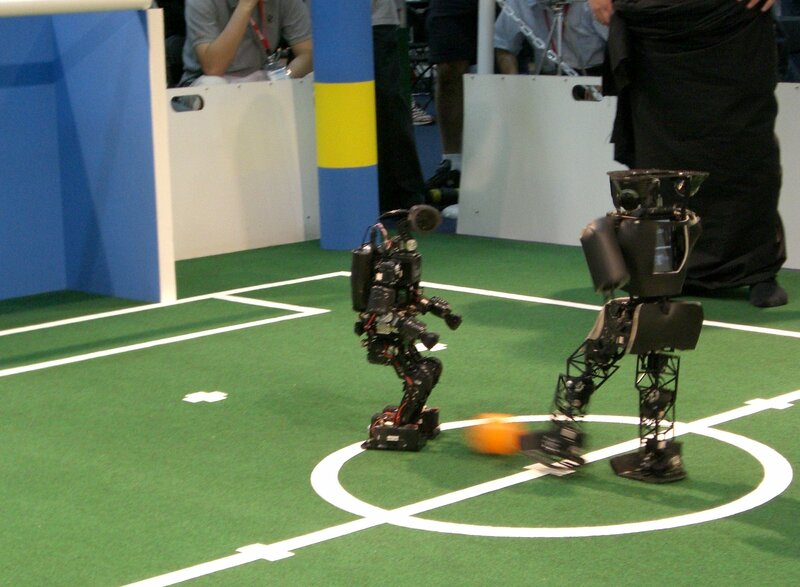 The best robot was from Team Osaka, it even managed to walk over rough terrain. 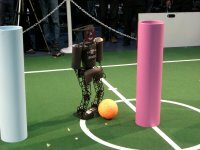 During the first round of the penalty kick competition, Team NimbRo achieved in the Humanoid Kid Size League an excellent result with 12 : 0 goals! We are now the leading team of our group. 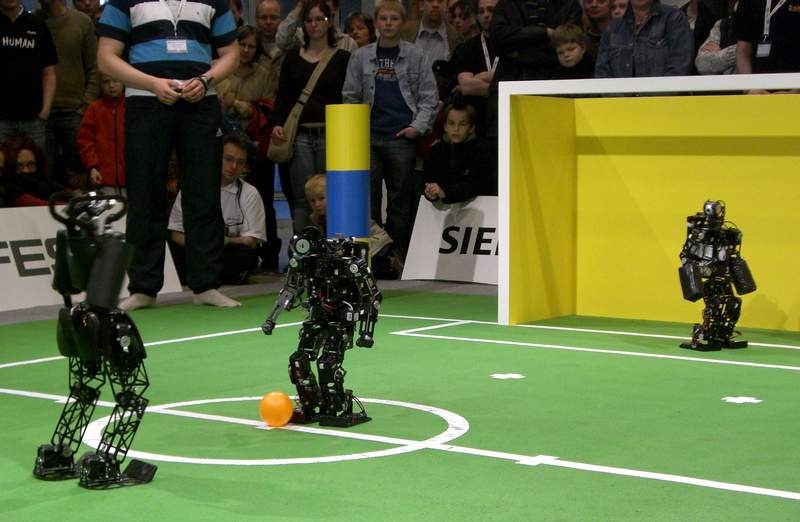 The picture on the right shows our robot Jupp striking a goal against Team ToinPhoenix.